For many, the 4-Speed Toploader is the epitome of sporty driving. It is, according to many opinions, the most stable built Ford transmission ever. It is unbreakable – but what lasts forever. In total, there are 133 different types of transmissions, that does not make things much easier. A distinction is made between short and long gear ratios (Ratio): 25, 28 or 31 teeth on the gearbox output, transmission input shaft with 1 1/16 or 1 3/8 inch and a few different lengths. The length of the main body is however always identical. It changes only the length of the Tail housing (the “tube” at the back of it). For final confusion is, that the tail housing still has to pay attention to the position for the 3 threaded holes for the assembly of the shift linkage. There are also differences here! The following tables will hopefully help with the assignment. For the RUG-AR the transmission is long OR short. Here, the gear must be opened and the teeth of the second gear has to be counted. 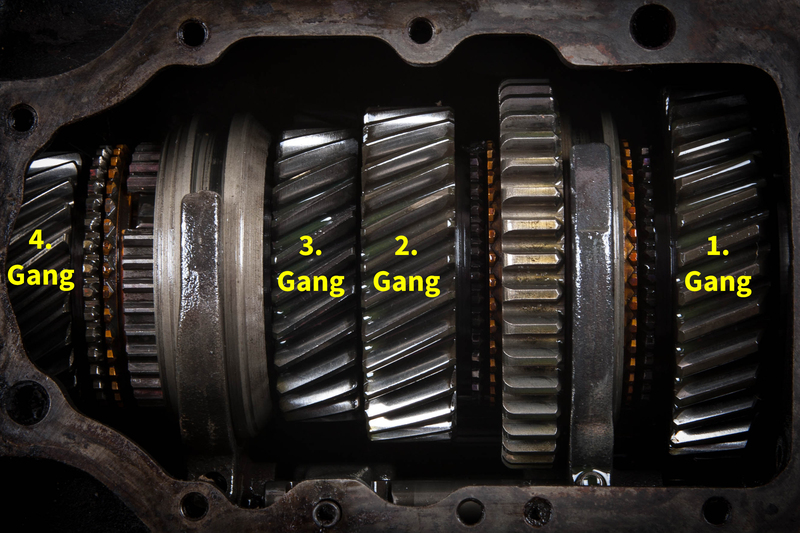 The 2nd gear is the second largest gear with the oblique teeth. The important transmission code is on a small sheet of metal flag (which unfortunately has been worn down from time to time). The oil to be used is a 75w90 and it should be exactly 1.9 liters pure.